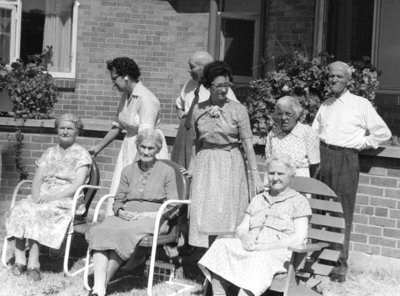 A black and white photograph of residents at the main entrance of Fairview Lodge. Fairview Lodge was built as the County Home for the Aged, to replace the old House of Refuge in 1950/51 and officially opened by Ontario Premier Leslie M. Frost on December 19, 1951. Main Entrance Fairview Lodge, c. 1952, Wilfred O'Rourke. Whitby Archives 07-006-018.